Three middle chapters cover genealogy standards as they relate to DNA and documentary evidence. Karen Stanbary applies the Genealogical Proof Standard to genetic genealogy in a hypothetical unknown parentage case illustrating start-to-finish analysis. Patricia Lee Hobbs uses atDNA to identify an unknown ancestor and that ancestor's maiden name, moving back and forth between documentary and DNA evidence. Thomas W. Jones describes best practices for genealogical writing and publishing when incorporating DNA evidence. "Have you incorporated DNA in your genealogy toolkit? Advanced Genetic Genealogy is the book you've been waiting for! It delivers answers to questions you didn't know you had, in illuminating detail. Invaluable for anyone wanting to make the most of DNA in their research." "Bravo! A much-needed entry into the field. As an "intermediate" DNA-user, I learned a good bit and was reminded of things that had dropped out of my routine. This is a reference work with topical chapters-easy to consult one chapter when it is particularly relevant to something I am doing. Definitely not an entry-level book, but written with clarity in mind." Debbie Parker Wayne is a board-certified genealogist experienced using DNA analysis and traditional techniques for genealogical research. Debbie is the co-author with Blaine T. Bettinger of the award-winning DNA workbook, Genetic Genealogy in Practice, published by the National Genealogical Society (NGS). She is the author of the online, self-paced course, Continuing Genealogical Studies: Autosomal DNA, offered by NGS. She is the DNA Project Chair for the Texas State Genealogical Society (TxSGS) and the Early Texans DNA Project. Her publications include a column on using DNA analysis for genealogical research in NGS Magazine and in TxSGS's Stirpes journal. Debbie was the course coordinator for the first beginner and intermediate DNA courses offered at four major U.S. genealogy institutes. As background, I am an advanced-skills genealogist, with no science background, but continually striving to more fully understand the genetic sciences, as applied to DNA testing for genealogical purposes. While I tend to purchase virtually every genealogy-oriented DNA book that comes on the market, there are usually written by one author, and while often very useful, rarely cover all issues of greatest interest to me. Said another way, they may be very strong in one area, but not another. 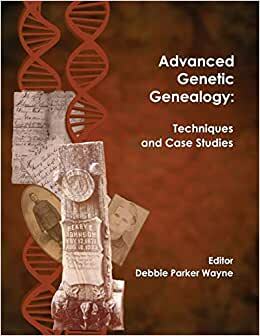 I just recently purchased "Advanced Genetic Genealogy: Techniques and Case Studies" edited by Debbie Parker Wayne, and I simply could not be more pleased with this invaluable addition to my ever-growing DNA reference library. Rather than one author attempting to be "all things to all people," it is actually a collection of (14) widely- recognized subject-matter-experts all writing individual chapters on their own fields of interest and expertise. The result is a highly detailed, yet "very accessible" review of the various technical issues and direct applications involved with DNA testing for genealogical purposes. It is heavily illustrated with full-color diagrams, charts, etc., that are well labeled and captioned, with detailed footnotes throughout. All this is supported with a detailed glossary, recommended additional reading, and a strong index. While I personally use FamilyTreeDNA as my selected labs of choice, numerous references are made to all of the major DNA labs and third-party analysis platforms, to include 23 and me, ancestry DNA, GEDmatch, Yfull, etc. This volume is so very complete, that it has now become my "go-to" reference for genealogy-related DNA testing issues, and I highly recommend it. I ordered this book on faith, based on the reputations of the authors, most of whom I either know personally, have worked with in various genealogical institute settings, or have followed through genetic genealogy books, blogs, and webinars. At first the price seemed steep, but to my delight the content is rich. Most important to me is the addition of color graphs and charts - essential for understanding visual phasing or clustering. BRAVO to the editor for insisting on color. Given the choice of grey scale or color, I believe you'll agree color was the right choice. I've had it 2 days and already spent "too many" hours reading it, where I should have been doing something else. I expect more of that to come, and for this to become an invaluable resource gong forward. This book, though paperback, is of very high quality. The paper is thick. The content is EXCELLENT and features chapters by the most respected experts in their fields. The book is designed for those who already have an intermediate level of understanding of genetic genealogy. I look forward to reading their sage advice as I take my knowledge to the next level. 5.0 out of 5 starsA Great Third Text for my Genetic Genealogy Library! A wonderful collection by respected authorities on genetic genealogy. I have Blaine's Family Tree Guide .... , Blaine and Debbie's Genetic Genealogy in Practice, and this makes a great #3! Well worth the extra price to get all of the color examples. All of the test results we see are in color, if these were in b&w, it would leave a lot to the imagination. Another quality product! Thank you.